Taishan Mountain is located in the central of Shandong Province. The main peak, Jade Emperor Peak, rising 1,545 meters above sea level, is at the north of Tai'ancity. The mountain is an early birthplace of China's ancient civilization and the area around. 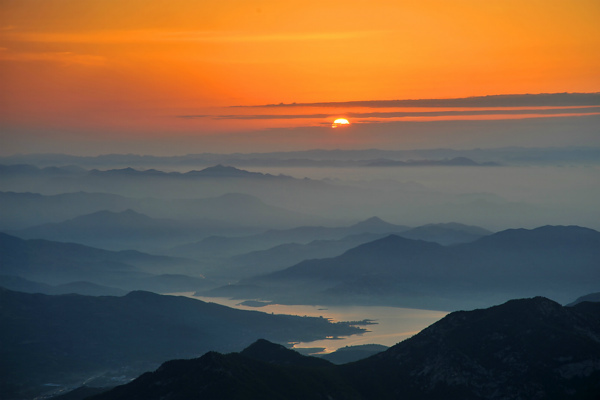 Taishan Mountain has 72 majestic peaks, magnificent waterfalls, centuries-old pines, cypresses and fascinating rocks. 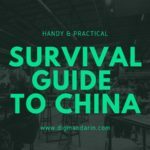 There are five tourist zones and two routes up the mountain-one in the east and one in the west. 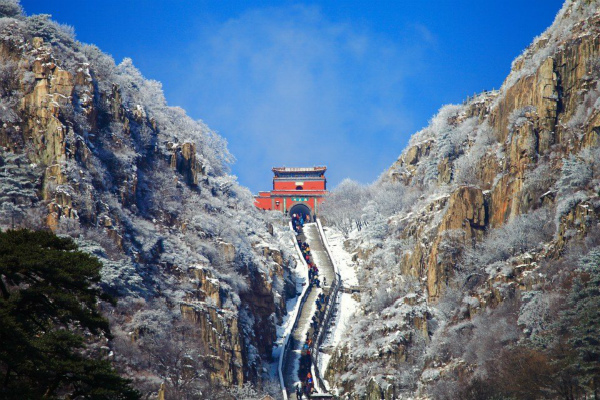 They meet at Zhongtian Gate and there are 6,293 steps in the nine kilometers leading to the top. Scenic spots include Longtan Reservoir, Zhongtian Gate, Five-Doctor Pine, Duansong Hill, 18 Turns, South Gate to Heaven, Bixia Tekmple, Zhanglu Terrace, Sun-Watching Peak, and Moon-Watching Peak. The four wonders of the mountain are SunRises from the East, Golden Belt Along the Yellow River, Beautiful Sunset and the Sea of Clouds. Other attractive spots are the Rare Rock Dock, Fan Cliff, Aolai Peak, Black Dragon Pool, Longevity Bridge, and the Dragon Pool Waterfall. 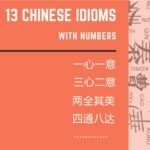 Running from Songshan Valley to the South Gate to Heaven, on the top of Danshan Hill, is apath with 18 turns called Ladder to Heaven. Although the path is little more than one kilometerlong it rises 400 meters. The steps along the path are made of Tianshan schist. There is now a cable car from Zhongtian Gate to the top of Wangfu Hill. Taishan Mountain is one of China's mountain parks and is a natural museum of history and art. 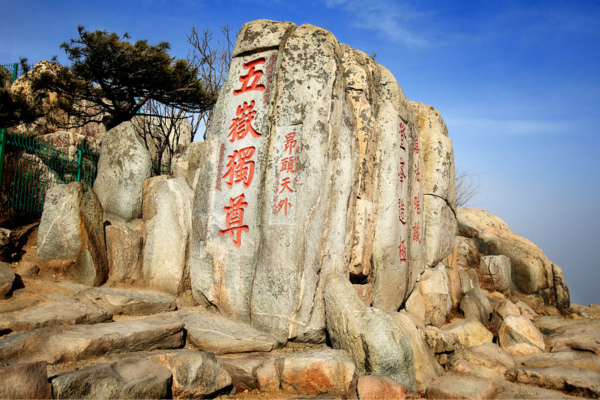 Along its axis there are 1,800 stone sculptures including famous ones such as the Carved Road from the Qin dynasty, the Buddhist Diamond Sutra in Sutra Stone Valley, the Wordless Stone Tablet and the Scripture of Taishan Mountain History carved on Tangmo Cliff. Tiankuang Hall in the Daimiao Temple which is also on Taishan Mountain is one of the three great halls of China the other two are the Hall of Supreme Harmony in the Forbidden City, Beijing, and Dacheng Hallin Qufu. The 40 statues of arhat in the Thousand-Buddha Hall of the Lingyan Temple date to the Song Dynasty and are prized for their individuality and expressiveness.